OctoInkjet is located and trades from the United Kingdom but we do our best to support International customers by making it as easy as possible for you to be able to view products and pay for orders in the more common currencies. The following options are available to simplify your browsing experience and minimise fees when you purchase from OctoInkjet. As Paypal supports payment via Debit/Credit without requiring a Paypal account we're now only supporting AUD$ and CAD$ through Paypal. 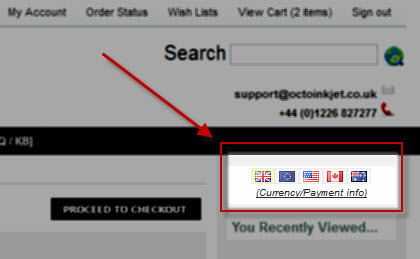 You can select the currency you wish to pay in by locating and clicking on the most appropriate flag in the top-right area of your store (see image, left). "Credit/Debit Card (£, Euro, US$)"
Paying in your own currency (if available) will help reduce the charges normally associated with foreign currency transactions. Note: Some banks and card issuers will apply fees/charges for "Cross-border" / "International" transactions so please check with your bank/card-issuer before placing an order if you have any qustions about what charges may be applied. We are able to accept all our displayed currencies as payments using Paypal via the standard checkout process (not Paypal Express). All other payment options or currencies must be paid in Pounds Sterling (GBP) because of the problems associated with tracking currency exchange rates and other administrative bookkeeping. Note: Because of the way International payment clearing works, some International transactions will be accepted but flagged for manual verification. This means that the payment is held until the payment details can be checked, sometimes requiring direct contact with the customer to verify identity. Whilst this can be an inconvenience, the issue of fraud is one that affects both customers and businesses so these measures are designed to protect both parties as much as humanly possible. Your patience, in instances like this, is appreciated. Payment in USD can be made by ACH or Swift tranfers. Where possible we recommend the ACH option for US based customers. Payment must be made in the currency selected for the order and paid to the correct currency account (See above). If the above requirements have been ignored, orders may be rejected or held until such time as full payment has been received. In instances where a refund is necessary, the refund amount will reflect any deductions for bank charges incurred as a result of the payment, and/or refund. This option is provided as a courtesy to customers who have difficulty accessing and/or using other payment methods, but is not always the most time efficient or cost effective way of purchasing from OctoInkjet. If you are able to use a debit/credit card, paypal or one of the other online/immediate payment options this may be preferable. Transferwise is a service we have used for the last few years and we would highly recommend it to customers as an alternative to wire/bank transfers. The services allows international payments with considerable reductions in the bank charges normally required. More details are available on the Transferwise website. There are restrictions regarding who can use this service so please check the Transferwise website for more details.